The idea of ‘bail’ goes as far back as Ancient Rome, but the American form of bail evolved from 1,000 year-old English roots. Bail was created to reflect a prediction of the outcome of a trail. Even today, bail is set or not set, based on how well a defendant’s actions can be predicted in order to figure out if he/she will make all of the needed court dates and not have a relapse in misconduct. Finally after much abuse due to the fact that English magistrates ‘rode a circuit from county to county to handle cases,’ Parliament codified 51 laws, many found in the Magna Carta, covering among other issues, bail. Certain criteria was also set up for allowing bail. Bail was decided based on the nature of the offense, the probability of conviction and the evidence, as well as the criminal history of an arrestee. Initially the U.S. Constitution only looked at bail in habeas corpus actions or for protections against excessive bail under the Eighth Amendment. Through establishing The Judiciary Act, the government joined a number of states granting the right to bail for nearly all defendants (except capital cases). Another issues was that even though The Act provided for bail, because there was no one close (friend, relative, etc.) to the arrestee, it was hard for the courts to find a ‘reliable’ custodian for the arrestee. This also proved to be a problem because our country was at that time, quite open and unsettled. This created an easy avenue for arrestees to flee the courts and payment of all penalties. As the number of defendants rose, as well as the need for arbitrary monetary security, the commercial money bail bond industry was born. It is said that two brothers, Peter and Thomas McDonough in San Francisco, were the first bail bonds men as we know them today. They created The Old lady of Kearny Street, a business niche for underwriting bail bonds. Yet this niche was not without strife and inequalities. 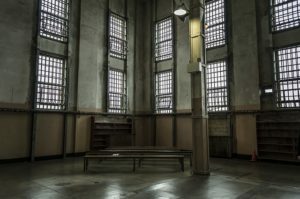 For many years, there was indecision and vast differences in bail amounts, its use or misuse, and how one’s attitude towards bail was deemed to be cruel and illogical. But in 1966, the Federal Bail Reform Act worked to reform the bail system in the U.S. by protecting the innocent, stopping bias against the poor and uneducated, and ended filling jails with people who were eligible for bail. Further reform came in the Bail Reform Act of 1984 where it established that defendants were to be held until trial if they proved to be a danger to society, outlined categories of defendants to be held without bail, and created ways to decide who was eligible for bail and/or bail hearings. The one thing you must always remember – posting bond is a binding contract. It is a person’s promise that you or the arrestee will, indeed, come to court for all court hearings, as well as obey all of the court orders. Michigan has a ‘fugitive recovery program,’ which does allow for the hire of an individual to track down bail jumpers and use whatever means they see fit in order to bring the ‘jumper’ back to the courts. It’s not an easy job, and does have its perilous moments, but these ‘recovery agents’ in some instances, can have more rights than law officers. There are no licensing requirements, so you need to think about whether or not you really want to chance encountering one of these recovery agents. You may be better off going to court and accepting whatever the outcome is! Still not sure? Have questions? Contact Detroit Bail Bonds and get the guidance that you need on posting bail in Michigan. It is not easy being arrested and the staff at Detroit Bail Bonds will work with you to make sure your rights are protected, you get a fair bail hearing, and understand all of the consequences should you begin to think about running. Their prompt and courteous service is well-known, and you can rest easy knowing our team will be with you throughout the whole court and bail bond process. This entry was posted on Thursday, December 31st, 2015 at 1:48 am and is filed under Bail Bond Process. You can follow any responses to this entry through the RSS 2.0 feed. You can leave a response, or trackback from your own site.